Dining area with our new shelf unit for showing off my tea pots and keeping glasses & dishes within quick reach. Entertainment center with 5.1 sound, Apple TV, HD-DVD (antique!) and my amazing TV. The Enterprise looks on with approval. 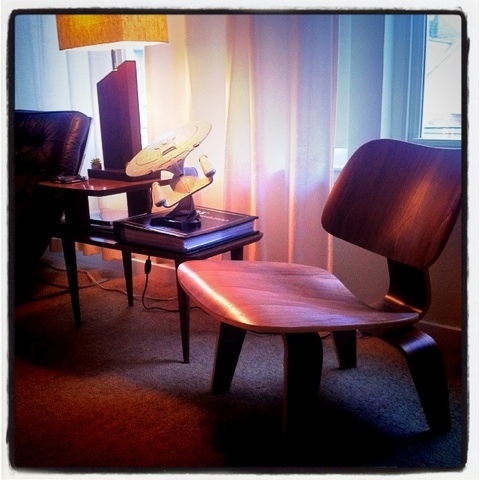 The Mid Century Collection - a Mies VanDer Rohe Barcelona Chair (ca. 1929), Charles & Ray Eames LCW in walnut (ca. 1940), and two two-tiered tables finished in walnut (ca. 1960s). The tables are vintage, the chairs reproductions. Our bright red sofa/chaise lounge paired with our two 1950s side tables. A Nikki McClure print (Invest) on the wall in the hallway. A view of the entire living room with my 30" panorama of the Los Angeles skyline hanging over my desk. I ordered a new chair for the living room; it's a replica of the Charles and Ray Eames LCW (lounge chair, wood) plywood lounge chair. It compliments the other walnut furniture and mid century modern style of the apartment so far. It's actually very comfortable to sit in, despite looking solid. 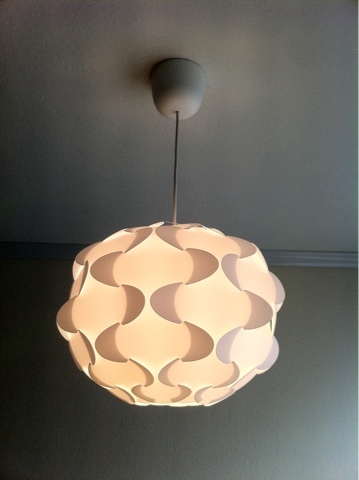 It makes a huge difference in the feel of the room since there's so much more character to the fixture.